Ready to rock and roll? Or rather is your child ready to rock and roll? If your kids are asking for a drum set, you are going to need to buy the right one. For younger kids, a full-size drum set won’t do. Full-size drum sets are too big for kids to learn on. But buying just any ole junior-sized drum set might lead to disappointing results. And if you’re worried about price, know that a good quality drum set just for kids doesn’t have to cost an arm and leg either. We’ve chosen the best drum sets for young and older kids, both traditional acoustic sets as well as modern electric sets. We’ve included drums that are a little more compact for smaller spaces as well as sets that can grow with kids. There are some things you as a shopper need to know before choosing a drum set though. Some drum sets on the market today for kids can be more like toys than real instruments and this can also be discouraging for kids who are eager to learn how to play. So let’s go over what you need to know before choosing the right drum set for your child including which kind you should choose, the parts of the drum set and more. Is my child ready to learn to play the drums? Besides being one of the coolest instruments out there, learning to play the drums has plenty of benefits. Not only will learning drums improve hand-eye coordination it can also help reduce stress, boost brain power, and like learning other musical instruments, can help improve overall academic performance, especially in math. Learning a musical instrument like drums can give kids a boost of confidence. But when it comes to drums, it can also be an aerobic activity. Jamming out on a drum set can get the heart pumping and even have kids breaking a seat! Your child is excited to learn drums. Great! But is he/she ready? There are a couple of things to consider before signing your child up for drum lessons. Let’s take a look at what they are. Not only does your child need to be strong enough to hold a pair of drum sticks, but he or she needs to be able to hold them the right way and control the sticks to create the beat. One suggestion is to start by having your child drum on their legs by using their fingers or hands to get the idea of how rhythm works before introducing drum sticks. Drum lessons can be as long as an hour, which for a young child may be way too long. Their attention span isn’t ready to focus for that long. Instead, consider lessons that are 30 to 45 minutes to start. Also, choosing a drum teacher that has experience with working with kids is your best bet. They will know how to not only teach kids drums but keep your child’s attention while doing it. If you are unfamiliar with the parts of a drum set, here’s a quick overview of what each piece is. Most drum sets for kids include 5 pieces but some include as little as 3. The bass drum. This is located in the center of the drum set and is the largest drum with the deepest sound. It is also referred to as the kick drum or the kick. This drum is not played with drum sticks but rather a bass drum pedal. The snare drum. The most important drum in the set, the snare drum is part of a drum set but also can be played alone like in a marching band. It makes a sharp staccato sound when hit with a drum stick. The hi-hats. The hi-hats are a pair of cymbals that can be played with a foot pedal and/or with the drum sticks. They are usually located on the left side of the set. The tom-toms.Also known as the toms, there are two different types of toms: mounted toms (located over the bass drum) and floor tom. While they look similar, they usually make different sounds. The ride cymbal. This large cymbal is located on the right side of the drum set and is played by using the tip of a drum stick. Ride cymbals are usually in full-size sets rather than junior-sized sets. The crash cymbal. This one is going to make the most noise! Unlike the ride cymbal, the crash cymbal is smaller and is played hard (hence the word crash). It is common to see multiple crash cymbals on a drum set. Other pieces that can be found in a drum set, but usually not in a children’s drum set include a splash cymbal (like a crash cymbal but much smaller), a crash/ride cymbal, and a China cymbal (which looks like a crash cymbal that’s been put on upside down but has a very unique sound). There are pros and cons of both electric drum sets and acoustic drum sets. Acoustic drums sets are generally inexpensive but as you probably already know, they are loud. If you have a separate space or room such as a basement where kids can practice or don’t mind the sound of your child practicing, then the sound might not be an issue. Electric drum sets, on the other hand, can be super quiet. Kids play them the same way, except they can put on headphones if you need a little peace and quiet. If your child wants to perform for you, electronic drum sets can be plugged into a speaker. The downside is electric drum sets are typically more expensive. All drum sticks are not created equal. Choosing the right drumsticks for your child is important. Here’s what to look for. Straight. It’s important for drumsticks to be straight and not warped. To see if drumsticks are straight, roll them on a smooth surface. If they wobble around, then they are not straight. Type of material. Most drum sticks are made out of hickory which is a durable medium weight wood. However, drum sticks can also be made out of oak or polyurethane, both of which are heavier but super durable, or they can be made out of maple which is lightweight. The tip. The tip of the drumstick can be made out of wood or nylon and have different shapes as well, such a ball tip or an oval tip. Oval tips have a fuller sound while a ball tip has a more defined sound. Nylon tips have a defined consistent sound and wood tips have a more natural, organic sound. The number. When looking at a pair of drum sticks you’ll notice a number. Usually 2, 5 or 7. The number signifies the weight and how thick or thin the stick is. The lower the number the heavier and thicker the stick. The higher the number the thinner and lighter the stick. Choosing a pair of drumsticks comes down to what type of music your child will play. If they are going to be playing rock and roll, go for a heavier and thicker stick. If they are going to be playing jazz, then a lighter, thinner stick is the way to go. The letter.Next to the number, you’ll notice a letter, usually an A or B. This refers to the length of the stick and how the drumsticks will be used. For example, if you see an A those drumsticks are typically used for orchestra and are shorter, while a B will be used for concert or marching bands and are longer. Children will typically want to look for a pair of sticks that have an A in front of it. We’ve made it to our list and we have quite the list for you. Whether you are looking for a more traditional drum set, an acoustic 5-piece set that is loud and proud for kids to rock out on, or something that has the option of being quiet like an electronic drum set, we’ve included the best of each type. Be sure to check the age and size of the set. We’ve noted which sets are better for younger drummers, as young as preschool, and which ones are more suitable for your preteens and teens. Let’s set which drum sets for kids made our list! This drum set comes with everything you need to get your kid banging on the old skins for a very reasonable price. But don’t let the price tag fool you. The drums sound just as good as the more expensive sets. Included with this kit is bass drum and pedal, snare drum and stand, tom-toms, hi-hat stand, cymbals, and a throne. It’s worth noting that drumsticks are not included with this set. 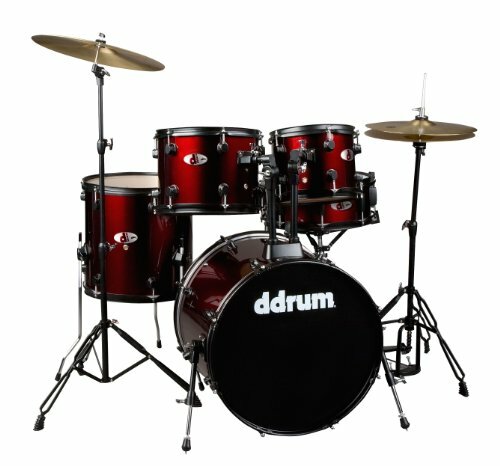 The ddrum drum set comes in black or red. If you’ve never assembled a drum kit it may take a little time, and perhaps a trip or two to Youtube for some help. The set comes with everything beginner drummers need. May take a little time to assemble. Top Seller & Makes the Ultimate Gift! The drums have real wooden shells and are painted with a vibrant high gloss. 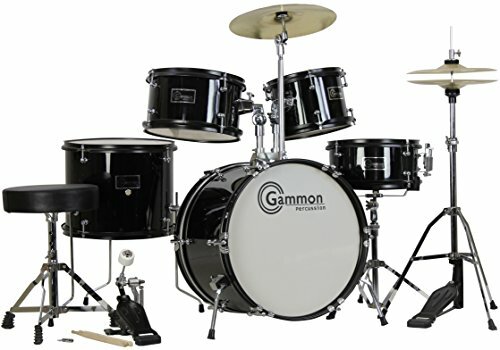 The Gammon Starter Drum Kit includes a 16” bass drum and pedal, a floor tom, two mounted toms, a snare drum and stand, hi-hat stand, cymbals, stool, drum key and drumsticks. Putting this drum kit together is surprisingly easy and the size of the set is perfect for kids under 10 years old. Includes drum sticks and drum key. Perfect for extra young drummers. Kids may outgrow this set fast. For a little older kids, the V-Drum Set by Roland is great for beginners. The beater-less kick pedal keeps this electronic drum set extra quiet and its compact size makes it great for those tight on space. The control panel allows kids to change the sounds of the drums, play the metronome to help them practice as well as connect to an MP3 player to play along to their favorite songs. The set is easily adjusted and can be positioned to work for kids and adults. This set includes a mesh-head snare pad, three mesh-head tom pads, a hi-hat and stand, crash cymbal and kick pad with cloth head. Does not include drumsticks, throne, speaker or headphones. 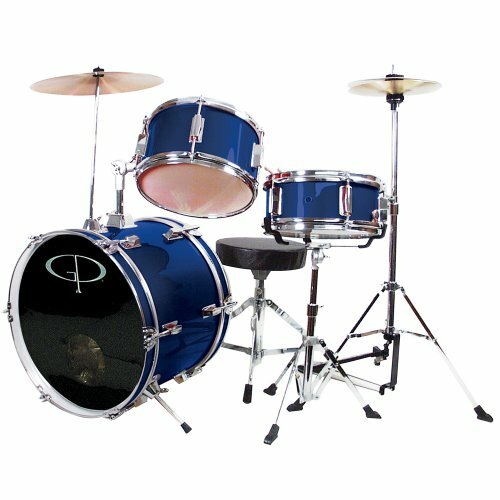 If space is a concern or a 5-piece drum set is just too overwhelming for your child, stick to the basics and check out this 3-piece drum set by GP Percussion. It doesn’t include some of the drums and cymbals a 5-piece set has, but it has all the things kids need to rock out. Attached to bass drum are a crash and tom while a snare and snare stand and hi-hat stand separately. Fewer pieces also mean a lower price, making this set affordable on almost any budget. Also included with this set are drumsticks, drum key, and a throne, however, the quality of the throne isn’t as great as the rest of the set. It might be worth swapping it out for something better. Stands can be easily adjusted. Instructions are hard to follow. Super affordable and perfect for young beginner drummers, the Medini by Cecilio set has everything including drumsticks and a throne. This set includes 2 mounted toms, a floor tom, snare drum, and stand, bass drum with pedal, hi-hat with stand and crash cymbal. The recommended age group for this drum set goes by height: 2.5 feet to 5 feet tall. And there’s a color for every kid. 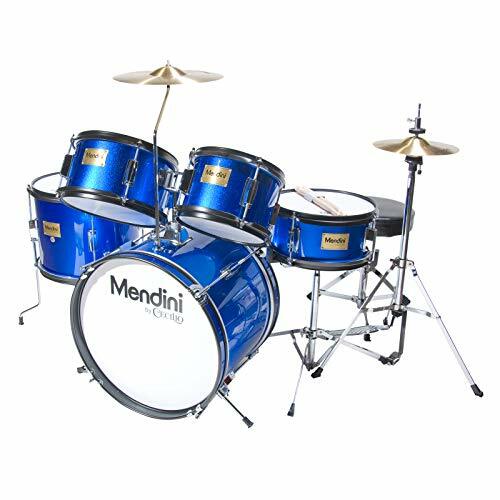 This drum set comes in blue, black, bright red, green, silver and wine red. Great for really young drummers. Instructions are difficult to follow. 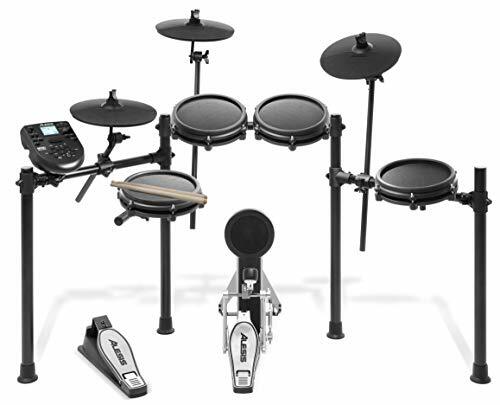 This surprisingly reasonably priced electronic drum set is perfect for older kids and beginners (and for parents who don’t want to hear them practice). The Nitro Module has 60 built-in songs for kids to play along to as well as a recorder, metronome, sequencer, and a CD/MP3 aux if they want to play along with their own songs. This 8-piece configuration has a dual-zone snare pad, 3 tom pads, 10” cymbals, ride cymbal, hi-hat with a pedal, crash with choke and a kit drum with pedal. Also included with this kit is connections cables, drum key, drum sticks as well as a power supply. The downside is that a seat/drum throne and headphones/speakers are not included with this kit and will need to be purchased separately. 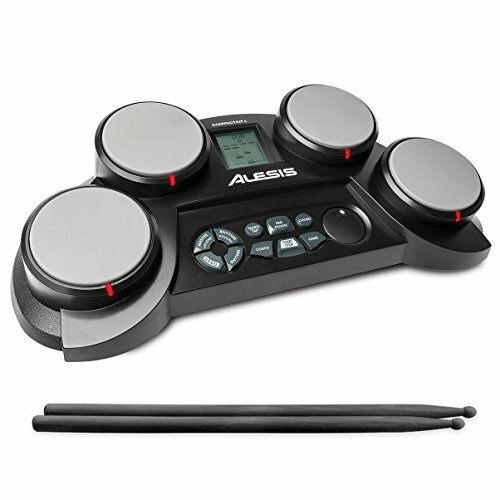 Good value for an electronic drum set. Can hook up to CD/MP3 player and play along. 60 built-in songs to play too. Comes with cables, drum key, and drumsticks. Does not include a seat or headphones/speakers. This drum set by Ludwig costs a little more than the other acoustic drums on this set, but if you don’t mind paying the extra, you’ll soon see it’s worth it. The sounds of these drums beat many of the less expensive junior-sized drum sets on the market. Available in black, blue and wine red, this complete set comes with a steel shell snare drum, cymbal, and stand, 2 mounted toms, a floor tom, hi-hats with stand and of course, a 16-inch bass drum. Also included is a junior size throne. Assembling this drum set proved to not be as difficult as expected. 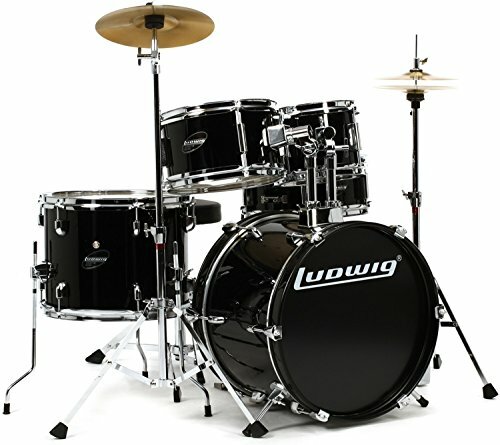 The Ludwig website even provides a video to help make assembly a little easier for those who’ve never put together a drum set before. Complete set includes a throne. 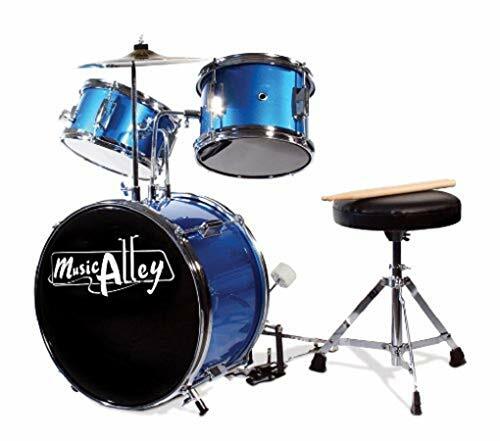 If you aren’t sure whether your child is ready to commit, or you are on a super tight budget, for kids 4-7 the Music Alley 3-Piece Beginner set is perfect. Great for small spaces, it has the basics to get kids started in the world of drumming. A tom drum, a snare, and a crash cymbal are mounted on the bass drum. Included with this set are the bass pedal, throne and a pair of lightweight drumsticks. While this set won’t last kids for years, it’s a great introductory set that comes at a super affordable price. Kids will outgrow this set fast. No space for a drum set? That doesn’t mean they can’t have a drum set at all! 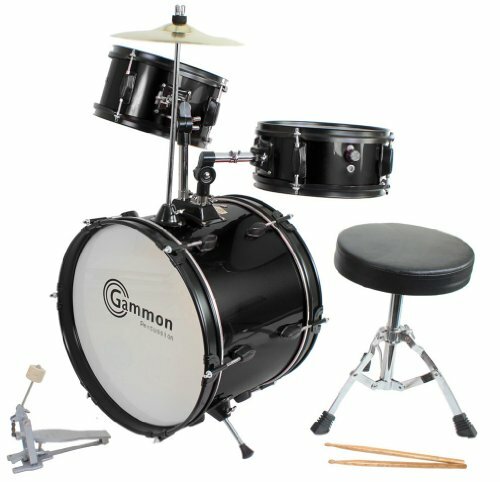 Check out this portable drum kit, great for kids 8 years and up. It has the whole drum set right on a tabletop. 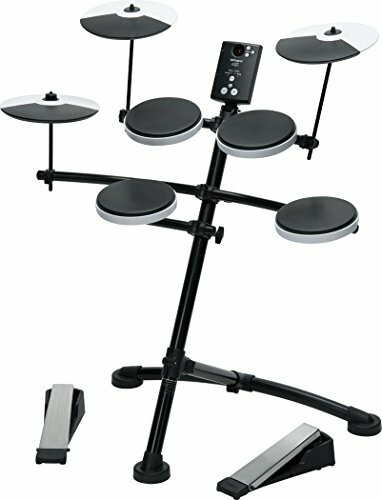 This electronic drum kit has 70 percussion voices, 10 effect voices and 50 built-in songs that kids can play along too. Drumsticks and headphones are included as well as an AC adapter. But if kids are on the go, it takes batteries too. The four drum pads give kids a similar feel to real drums and the music coach feature, as well as the game function, will help kids become better drummers. Music coach helps kids improve drumming skills. The sound isn’t as good as a real drum. Best Value & Top Seller - Ships Fast! Like the 5-piece Gammon Percussion set, this 3-piece set is a durable, quality set great for kids ages 3-8. While it doesn’t include all the drums and cymbals as the other set, this basic set has everything kids need to rock and roll! This set features a 16-inch bass drum, two tom drums, and a cymbal. It also comes with a drum key, drum sticks, and a throne. Fewer pieces mean this great for smaller space, but it has the same quality as the 5-piece set. This set is available in black and blue and is pretty easy to assemble. Suitable for kids as young as 3. Includes drum key, drumsticks, and throne. Q: What age can my child start learning how to play the drums? A: It depends on the child, but in general, kids will have the strength, coordination and attention span to sit down and learn the drums around the age of 7. However, some might be ready a little sooner while others may need an extra year or two. Q: Why do some drummers put a pillow in the bass drum? A: Putting a pillow in the bass drum will muffle it. Some drummers do this to get a specific sound out of the drum. Placing a pillow will change the amount of resonance it gives off. Q: Should I get a 3-piece or a 5-piece set? A: We’ve included both on our list, but which one should you choose? If space is a concern or a 5 piece set is overwhelming to your child, then we suggest you opt for the 3 piece set. However, for most a 5-piece set is the way to go. While children may not use some of the drums at first, a 5-piece set is more versatile and has everything kids need to play different types of music.